SHOP FOR A CHRISTMAS TREE & SUPPORT PS 154! If you buy a Christmas tree, buy it from FOLEY FIRS on 8th St. and 8th Ave. Mention PS 154, and they will donate minimum $10 to our school for every tree sold. Or order from www.foleyfirs.com — you can have the tree delivered for free and never leave your house! TELL ALL YOUR FRIENDS! They just have to mention the school — and don't have to have a child at the school for us to benefit! *Please* join us for the second club meeting! The book is Playful Parenting: An Exciting New Approach to Raising Children That Will Help You Nurture Close Connections, Solve Behavior Problems, and Encourage Confidence, by Lawrence J. Cohen. We will have 90 minutes to share our thoughts and ideas, and then can continue socializing off site at a TBD location once our time is up. A cozy winter festival for the family! Get your holiday shopping done with our Silent Auction and Teacher experience raffle plus a NEW local holiday market, featuring a Terrace Books pop-up shop. Please help us make Winter Fair happen! We need you to help turn our school into candy land, help our kids with craft projects, and serve our community food. All volunteers will be entered into a raffle for a $100 gift card! Remember, this auction is one of the biggest ways we raise funds for our school. If you have something to donate, please email Auction Chair Karen Sarraga at ksarraga@gmail.com! 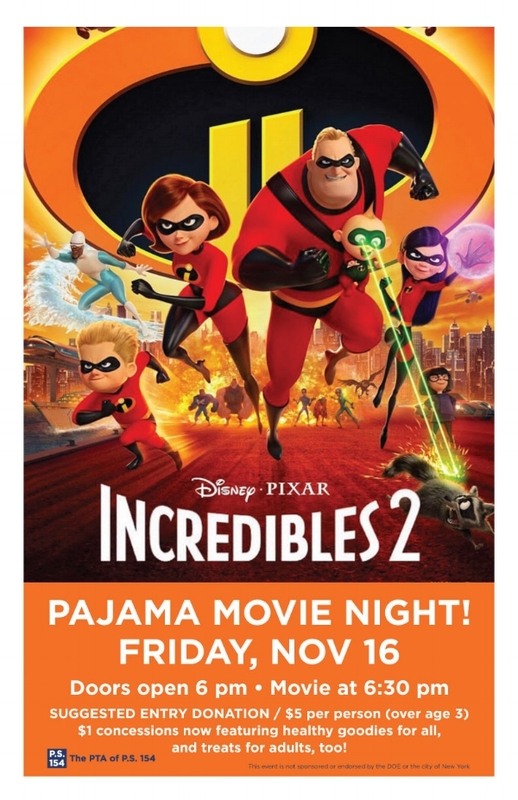 PS 154’s beloved movie series offers a cozy place for children and their adults to watch a movie together, with pizza, hot dogs, and snacks! $1 concessions Now featuring healthy goodies for all, and treats for adults, too! Do you have children who love to play chess? Do they want to play in a tournament? If your child knows how to play and wants to compete, there is a group for them. Kindergarten to 12th grade! The players’ schedule is organized by rating, and if this is the child’s first time, the rating system groups the kids in the beginner group. There is a lot more information on the registration form! A growing body of research supports the idea that practicing generosity, kindness, honesty, determination, and patience leads to resilience and happiness. With his expertise in mindfulness and psychology, Dr. Christopher Willard, PSYD, offers a profound exploration of how to cultivate a mindful family amidst the chaos of our modern world, planting compassionate and wise seeds for our children and our future.